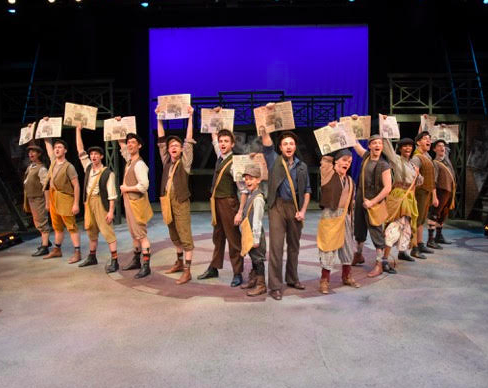 WBT does a real professional job with “Newsies,” the story of a group of young newspaper delivery boys led by Jack Kelly in a protest against the rising prices of the New York newspaper, The New York World, published by Joseph Pulitzer. Most of the deliverers are poor orphans and runaways who slept on the streets of New York. The protests lead to a strike, followed by efforts to break the strike. It is tale of corruption, meanness and strife. The story is well told in the lyrics and music of “Newsies,” written by Alan Menken with lyrics by Jack Feldman and the book by Harvey Fiersten. Daniel Scott Walton is an energetic Jack Kelly who yearns to leave New York for San Diego and a better life but stays, inspired by young reporter Katherine who gets her story printed in the New York Sun. Newsboy Davey encourages Jack and Katherine and, though police and strikebreakers, attempt to end the strike the youngsters fight. 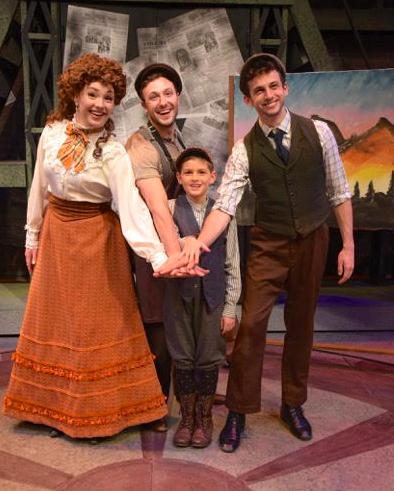 When you see it unravel on stage at Westchester Broadway Theatre, you will appreciate the mountains they had to climb to reach their goal. The romance between Jack and Katherine blossoms and the show builds to a great ending. Mary Beth Donahoe is convincing as the young female reporter who, in 1899, faced the facts of life that women as reporters were few and far between. The WBT audience this past Sunday afternoon was filled with many youngsters and parents and others who gave a great cast a standing ovation. Musical direction by Bob Bray….great! Mark Martin’s direction, right on! Choreographed wonderfully by Shea Sullivan, Producer Lisa Tiso…well done. I rate WBT’s production of “Newsies,” Three out of Four Stars. And the Sunday noontime food was just great. I had meatballs and cheese ravioli and Lemon Sorbet. Newsies, The Musical WBT’s 110th production! It is a story of a standing up to corruption and exploitation of young workers and the constant need for a free press in society. Don’t we all know that nowadays?